Smoked Turkey is one of our newest favorite alternatives for cooking. Of course we still love our family Traditional Baked or Deep Fried Turkey...we just love them all! DeepFried Turkey Instead?Click Here for the instructions. This is a nice change and moist delicious Turkey to try. I have always wanted to make my own brine and now I don't know what took me so long! What a juicy beautiful Turkey breast. Thaw your turkey in the refrigerator according to the label if using a frozen breast. This brine takes 2 hours of time for a 6 lb turkey. You may want to start out early in the morning. Pour the salt and sugar into the water and stir. Add the turkey breast and let it sit in the fridge for approximately 2 hours. After the two hour of soaking the Turkey in the brine rinse the turkey breast very well to remove the brine. Pat dry and add some salt and pepper, I also use cayenne and garlic powder on top. You can roughly estimate about 20 to 30 minutes per pound of turkey, but it's important to use a meat thermometer to be sure your turkey is thoroughly cooked. You don't need a smoker; any covered grill will give the same effect. Simply place the turkey breast on the cool side of the grill and use soaked wood smoke flavored chips. Preheat gas grill to medium-hot (350° to 400°) using both burners. Turn left burner off. Place wood chips in a disposable foil pan or a foil packet pierced with holes on grill over right burner. Remove turkey from brine discard Place turkey, skin side up, on grill rack coat generously with cooking spray over left burner. Cover and cook 2 hours. Turn turkey over; cook 15 minutes or until meat thermometer registers 170°. Remove turkey from grill. Cover loosely with foil, and let stand at least 10 minutes before carving. Saute minced garlic in a pan with butter. Add bourbon. Boil for around 5 minutes. Add the ketchup, lemon juice, vinegar, Worcestershire sauce, molasses, and the sugar. Stir and cook on low. Let the sauce cook until it thickens, around 20 minutes. 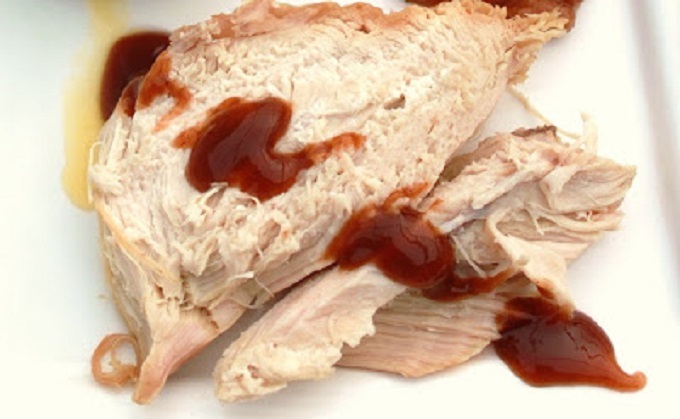 Serve Turkey with Bourbon Sauce, or it's just delicious without anything on it! If you don't want to brine your Turkey here is a wonderful marinade for the Turkey before you smoke it. Combine the first 10 ingredients in a small saucepan; bring to a boil. Remove from heat; cool. Combine lime juice mixture and turkey in a large zip-top plastic bag. Seal and marinate in refrigerator 2 hours. Soak wood chips in water at least 30 minutes. Drain well. We like the hickory wood chips for our taste or mesquite. Preheat gas grill to medium-hot (350 to 400) using both burners. Turn left burner off. Place wood chips in a disposable foil pan or a foil packet pierced with holes on grill over right burner. Remove turkey from marinade; discard marinade. Place turkey, skin side up, on grill rack coat generously with cooking spray over left burner. Cover and cook 1 1/2 hours. Turn turkey over; cook 15 minutes or until meat thermometer registers 170. Remove turkey from grill. Cover loosely with foil, and let stand at least 10 minutes before carving. Discard skin. The smoked turkey sounds amazing, i love all the spices that you are using here, and the bourbon sauce looks so flavorful, excellent! Brined smoked turkey breast sounds perfect to me. I must make some Bourbon sauce too, bet it would be great with smaller birds. Turkey breast are the perfect thing for a small family like ours. I have avoided purchasing due to the dryness factor you get with white meat. However, this recipe may be the key to a moister bird. I have saved this recipe to try. It does look delicious. wow..thats just perfectly made..looks awesome.. I'm always looking for new recipes for smoked turkey breast and these both sound very good. That bourbon sauce just sings! Kind of a southern sauce for the turkey? All those spices... adding flavor and nuance. We actually smoke turkeys around the 4th of July - outside! My only experience with brining was a disaster. Everyone else has grand results, so what's wrong with me? Happy Thanksgiving! I just brined a turkey. (I'm not hosting the feast, and I wanted the extras for leftovers!) And it was indeed moist. Wish I would have had your sauce, too. Your brined smoked turkey breast looks awesome. I'm sure Bourbon sauce is a good accompaniment. That sauce sounds absolutely awesome. I love the molasses and whiskey in there. Yes, I would choose the whiskey over the bourbon! Ok, this sauce sounds awesome. I may have to make some just for turkey leftovers. My family only wants traditional Thanksgiving dinner and since they will be cooking instead of me, they will get their way. I always wanted to brine a turkey...or a chicken! I don't know what I'm waiting for either - this looks wonderful! Love your sauce! That looks amaizing! I can't wait until Thanksgiving. I think this bourbon sauce sounds outstanding! This recipe deserved to buzzed! I've always wanted to make my own brine too, but I just never knew how to go about it! Sometimes I swear I forget I have the resource of my food blogging friends to draw from in times like these. :) Your turkey has me really excited for Thanksgiving!! The smoked turkey sounds great. Love the ingredients in this. Your Bourbon sauce is so lovely! We have done brined and non-brined turkey depending on what flavors we are going for...yours looks perfect!